The city of Mumbai is often referred to as the Finance and Accounting Capital of India, as it houses the Bombay Stock Exchange, which is the oldest stock exchange in Asia. In the past, Mumbai earned its prosperity through its seaport and textile mills until the 1980s. The establishment of TCS in 1967 marked the birth of the IT services industry in Mumbai. In 1973, the first software export zone, SEEPZ, was set up in Mumbai, where more than 80 percent of India’s software exports were carried out. Today, Mumbai is famous as an outsourcing destination for IT, healthcare and engineering services. Mumbai is renowned for its outsourcing abilities in application development and management (ADM), animation, game development, entertainment and media outsourcing services and finance & accounting services. The city of Mumbai has carved a niche for itself among the world’s top global outsourcing destinations with its robust infrastructure, developed policies and large talent pool of over 60,000 in the BPO sector. Mumbai is home to leading IT service providers such as, Cognizant, Infosys, Accenture, Wipro, Convergys, Minacs, EDS, TCS, Mahindra Satyam, IBM, ACS, HCL, Caliber Point, CSC, Genpact, Firstsource and WNS Global Services amongst others. 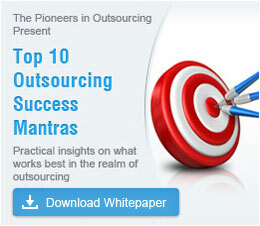 Mumbai ranks at number three among the world’s top eight global outsourcing destinations. Its favorable government policies, urban infrastructure and ample availability of quality resources have all made Mumbai a preferred outsourcing destination among foreign investors. Over 5 per cent of India’s total GDP is generated from Mumbai. Currently, Mumbai’s GDP is $41.3 billion, and its per capita income is $1,010, which amounts to three times the national average. In the year of 2008, the estimated exports from Mumbai in IT and ITES services were between $3.0 billion to 3.6 billion. Research has predicted that if Mumbai continues to grow at 63 percent on a yearly basis, it would touch $ 4.1 billion very soon. Good infrastructure and a high–quality talent pool have made Mumbai an attractive outsourcing destination for BPO services. Most outsourcers say that when it comes to finding the best BPO talent in India, Mumbai wins hands down. Apart from ADM, BPO and finance & accounting services, Mumbai is fast becoming India’s leading outsourcing destination for research and development services, marketing and financial analytics and legal process outsourcing. At present, Mumbai has over 30 registered units of electronic and hardware firms and over 74 registered units of electronics and software firms in SEEPZ. Outsources can easily find quality resources with exceptional skill sets in Mumbai for almost any service, be it engineering, research and development or software development. After the terrorist attack in Mumbai the NASSCOM–DSCI has promised a safer Mumbai by taking initiatives to train Mumbai’s police personnel for better vigilance. However, the terrorists attack in Mumbai has not affected the long term growth of offshoring in Mumbai or India. While on the business of outsourcing in Mumbai, you can experience world class luxury by staying at five star luxury hotels in Mumbai. Your luxury hotel in Mumbai can give you access to spacious meeting rooms, recreational activities, gourmet cuisine, travel arrangements and 24/7 room services. Is your business looking to outsource IT, ITES, healthcare or engineering services to India? Outsource to Mumbai and get access to skilled resources at a low cost. Outsource now!